She then promptly followed that up with a couple of facebook posts complaining about the attacks on “her” Anderson Cooper, so apparently she does still feel the need for traditional media sources. And I know for a fact that she is relentlessly checking in with DailyKos, Huffington Post and CNN and MSNBC websites for news about what’s going on in Egypt. Still, I think the fact that she’s following all these sources – mostly from her version of the device formerly known as a “cell phone” – is an interesting take on how information is assimilated by your average member of the generation now in their 30’s. The hour by hour forecast for my zip says clouday and windy for the rest of the day, but we’ve had full sun for most of the last couple of hours, barely a wisp of cloud or two in clear blue skies. For most of the morning the only traffic I saw were snowplows and a couple on a snowmobile but I just saw an actual passenger car go by. 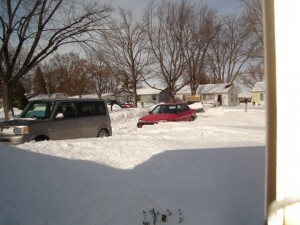 The streets are plowed, but not salted, ditto the driveway, where, after some considerable teamwork, the cars are free. I think the roads are still officially closed here in Kane County, but I suspect we could make it to the store with no problem if we had a need to go, but I for one feel no motivation to do so. 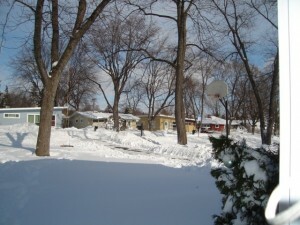 Anyway, for this household, and this community, it looks like the Great Snowpocalypse of 2011 is over with a minimum of bother. 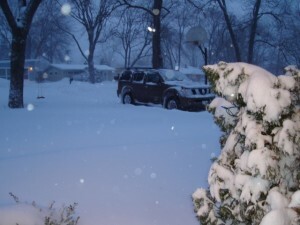 Snowpocalypse 2011: February 2, 7:00 a.m. The sun is up, and…I’ve seen worse. Of course the snow has not stopped falling yet, so it could get worse, but I think at this point what we can expect is a little more accumulation over the day – maybe a few more inches. 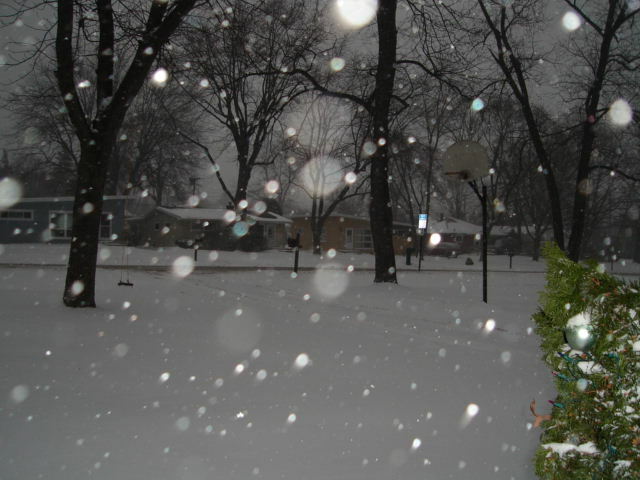 The accumulation here, so far, is not as heavy as I expected, but then again there is a lot of drifting. 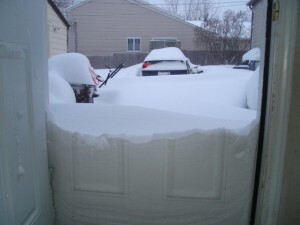 Then again, here’s a shot from the side door that shows the drift against that door is deeper, and the neighbor’s car (and the garbage cans and the snowblower) pretty deep in drifts. 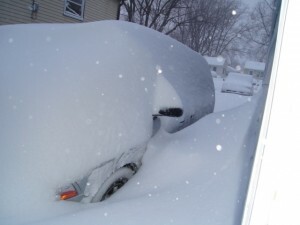 If you look closely at the right side of the shot above, you’ll see the front bumper of the mini-van – it’s going to take a while to dig that out. 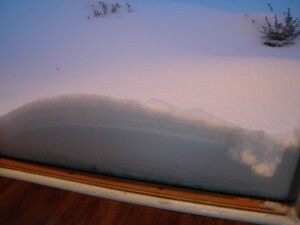 Here’s a shot of the snow between the van and the house. Most of the drifts seem to be fetched up against objects toward the south. Like I said, I’ve seen worse blizzards. Hope everyone is safe this morning. I have no idea how bad it may be in Chicago, with lake effect snow, I suspect it may snow prettily heavily there far longer than it will here – I need to go check the local news. But out here in the boonies I expect we’ll be mostly dug out by tonight. 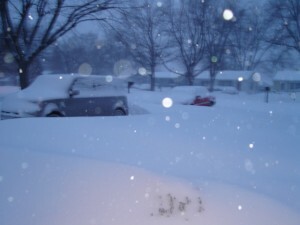 UPDATE: I just did go look at the local news, and they are predicting this one will go into the books as the third biggest blizzard in Chicagoland, after 1967 and 1999, so, yes, I have seen bigger blizzards. According to this article in the Daily Herald, the roads here in Kane County are officially closed. Also, if you do go out, you can expect to become stranded, and since they still have local snowmobile clubs rescuing people who got stuck last night (including police and snow plow drivers) you can expect to take a number and wait for help for a long, long time. So lets all stay home for a while, okay? 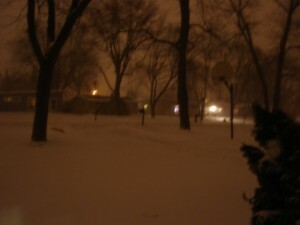 Snowpocalypse 2011: February 1, 9:30 p.m. Thundersnow! Lightning and thunder here and the snow is falling fast. 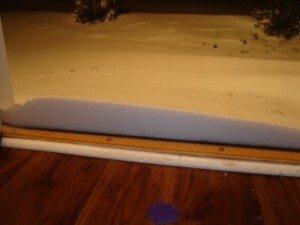 Not a weather phenomena you see every day, so glad I saw it before I went to bed. 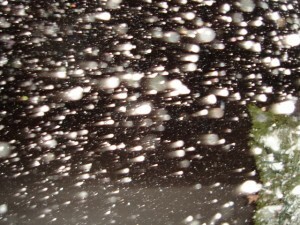 Neat ABC article on thundersnow here points out that only .07 percent of snowstorms produce thundersnow. 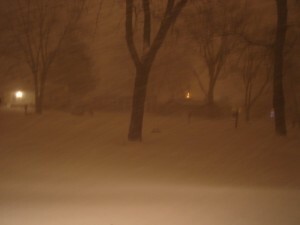 Also, per this article and the storm warning from the National Weather Service, thundersnow storms tend to produce the largest and most rapid amounts of snow. Also, we lost power for just a second, flashed off and then back on, right before we noticed the lightning and heard the thunder. We temporarily lost internet access too, but its all good now.